I started by tearing apart numerous pallets, aiming to have lots of boards to choose from. Paying attention to the thickness of the boards, trying to prevent major height differences between the boards. 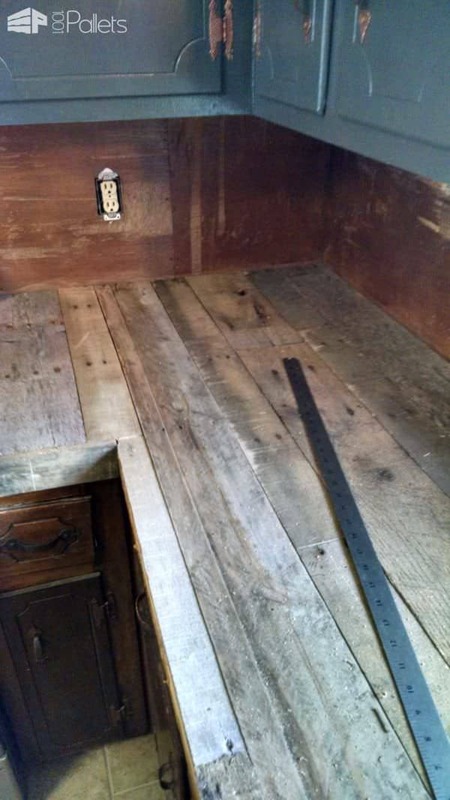 After I had a large pile of boards, the laminate removal process began from the countertops and backsplash. 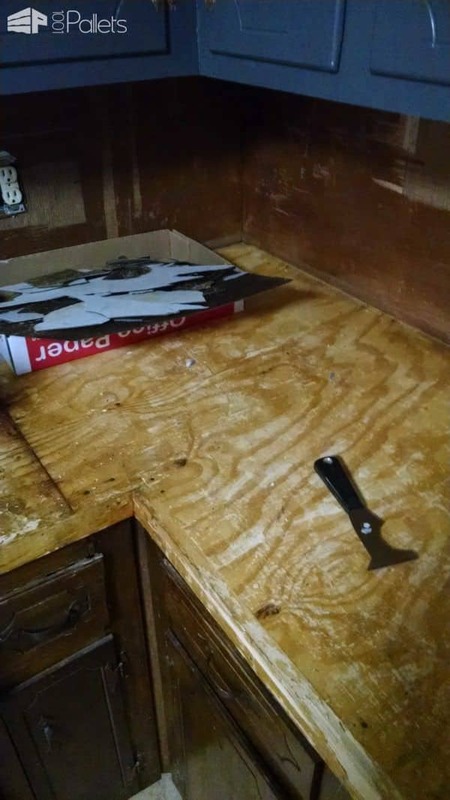 I worked slowly attempting to avoid damaging the plywood underneath. Once it was evident, I sanded any spots that needed it and cleared of debris. Next, I laid some boards on the counters, scattering width and colors attempting to create a unique look. Once I had a pattern, I started the back corner and used a nail gun to attach the boards to the counters. Each board was tested against the board before it, avoiding large gaps and holes. This process took time but eventually I had a nice pattern going. 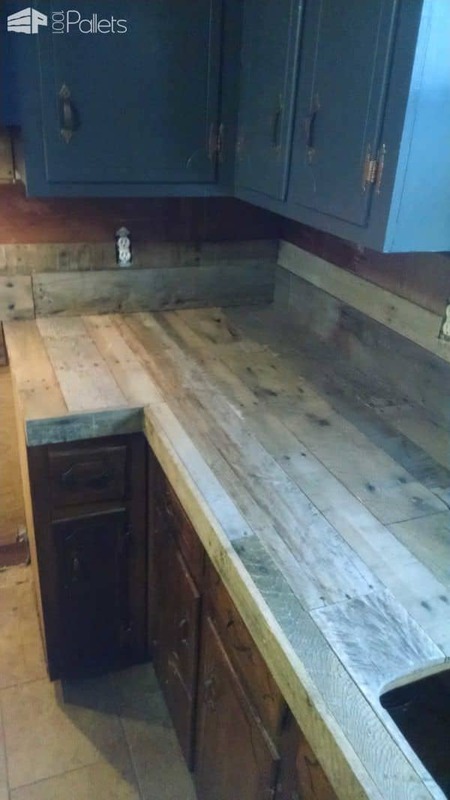 Once each section was completed, I cut down pallet boards to attach to the face of the counters. I leveled the tops against the new height created by the boards laying on the counter's surface. 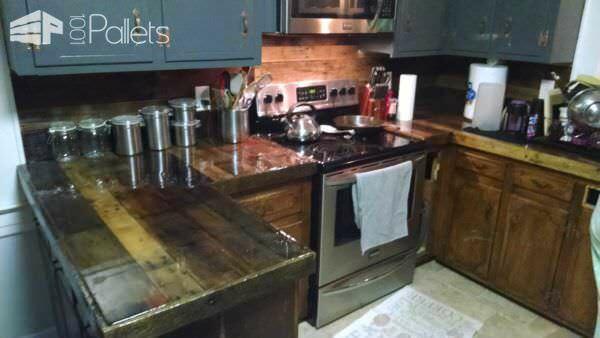 Once the counters were completed the backsplash followed the same pattern. Pieced together different color boards and worked them to prevent large gaps or holes. They were also attached with a nail gun. After all the wood was attached, I used a palm sander to smooth lightly out the boards and eliminate any jagged spots. Used a shop vac to remove all the dust and made sure the surface was clean. I decided to use Famowood Gloss Oil-Based 141-fl oz Polyurethane purchased at Lowes for coating the counter surface. This process was an epoxy that required spreading over the surface. After the first application, I felt much more comfortable with the process. 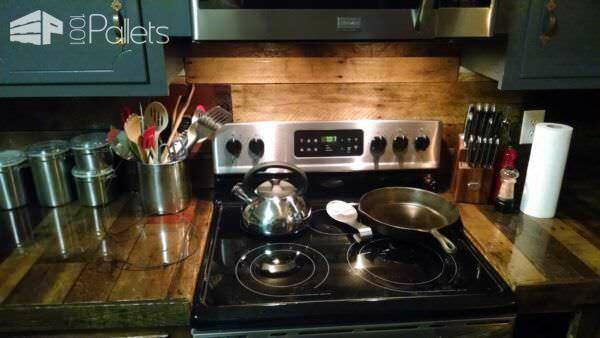 For the backsplash and face boards, I used regular Polyurethane and applied about six coats to protect and apply a glossy finish. So far the counters are holding up very nicely with no issues. Love the sink. 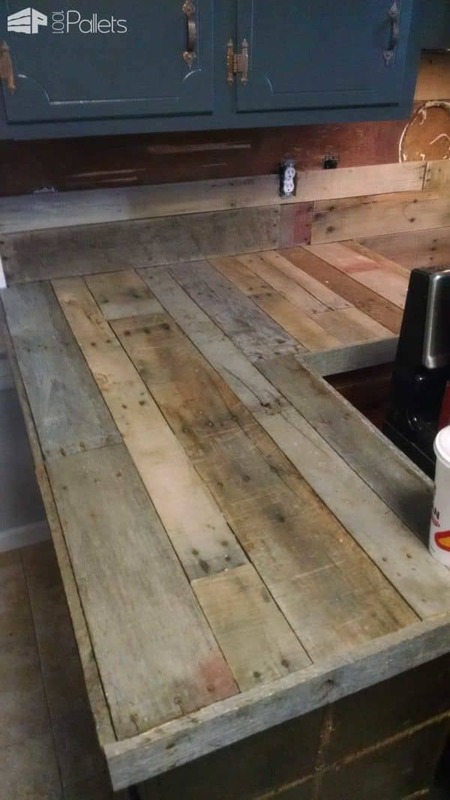 The counter tops a big no for me. Reminds me of those bar tops with the cards laminated under the resin in a restaurant. The wood looks so good with epoxy on it. 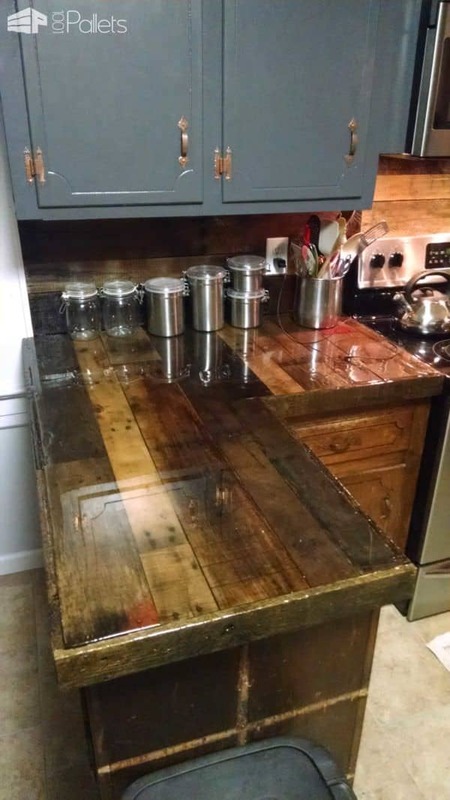 Pallet wood and epoxy resin…two amazing and underappreciated tools for home decor! 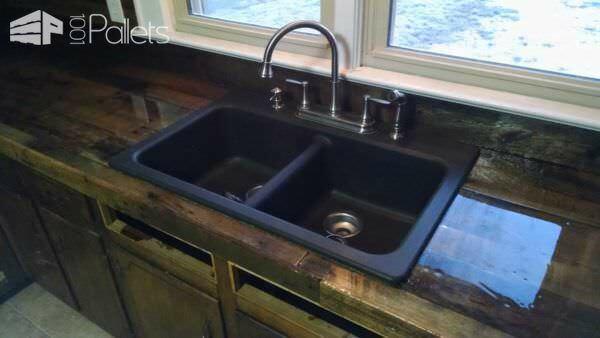 The style of Your DIY counter-top is really modern and distinctive! DIY project. Do you remain satisfied with the surface? Any changes you would make after the fact?  Como se llama el brillo de la terminación? I did mine about a year ago and used this stuff called Super glaze…it’s just one thick coat instead of thin clear coats, a major time saver! 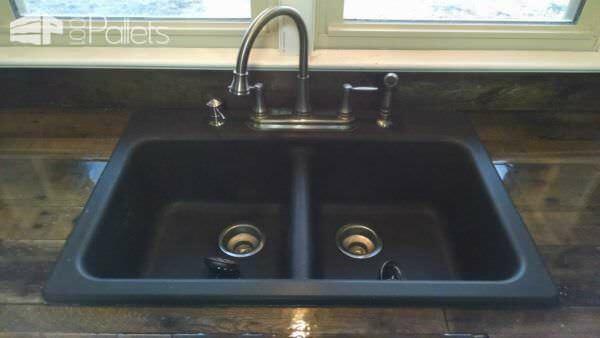 How did you do this around the sink area? And did you stain the wood at all? If so, at what stage in the installation? That really came out great. Did it take more than one can of the oil based poly on top?